Every house has a few creaky floorboards, and over at the CBR forums, Marvel fans are posting up what they reckon are the worst ever covers to come from the House of Ideas. Just when I thought the Rob Liefeld laden list wasn't going to offer any surprises, not only did I come across a piece from Frank Quietly (who should never be associated with a 'worst of' anything) but also this litte beauty, from the highly educational days of The Electric Company. 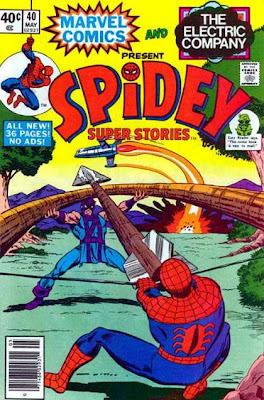 Sure Spidey has his back to you, and it should be Hawkeye doing the aiming and the web-spinner holding up the bow, but hey even the Mona Lisa has it's cracks! Definitely well worth the 40-cent cover charge!